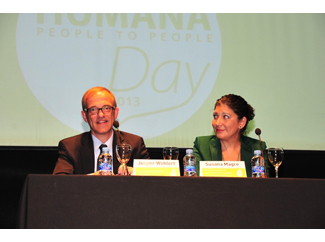 More than 150 people participated yesterday in Madrid on Humana Day, dedicated this year to Climate Change. 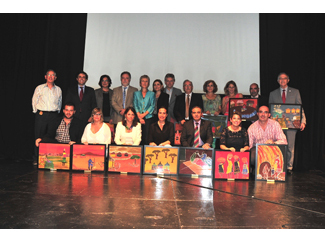 During the event was the awarding of the IV Textile Recycling Humana Madrid and Zona Centro Awards. In the section of municipalities and public entities : Torrelodones, Villaviciosa de Odón, Rivas Vaciamadrid, Galapagar, Madrid, Alcobendas , San Sebastián de los Reyes, Toledo, Avila, Provincial Environmental Consortium of Segovia, Aranjuez. In the area of ? ?private entities and other organizations: Church of Nuestra Señora de la Paz (Madrid ), Mercado de Las Ventas (Madrid ), Carrefour, Disa Peninsula (Licensee of Shell Oil ) Single Area Imsalud Primary Care, Supermarkets AhorraMas (Velilla de San Antón ), Red Cross Board of Getafe and Principe Pio Mall (Madrid). Susana Magro, director general of the Spanish Climate Change Office referred in his speech at the ceremony of the IPCC report, the Intergovernmental Panel of scientists from the UN on Climate Change, which has just been introduced in Stockholm. This report notes that Spain is one of the countries most affected by the effects of climate variability in the coming years. For this reason, the importance of aspects such as textile recycling, since they help to reduce CO2 emissions. The general coordinator of Humana Fundación Pueblo para Pueblo, Jesper Wohlert, said: that "when government, business and civil society work together and give scenarios, such as the textile recycling, in which this collaboration works, it is important to recognize , highlight and celebrate. "Wohlert added that "currently only collected 20% of the textile which is discarded in Spain, if the 20% allowed to do whatever we are doing, the question is what we would be able to achieve if you pick 50, 60 or 70% ". Humana general coordinator also said that "25 years ago, the textile recycling was for us a means to resources for development cooperation in the last 5 or 10 years, it has become also a key factor environmental protection and thus, work against the climate change challenge. " 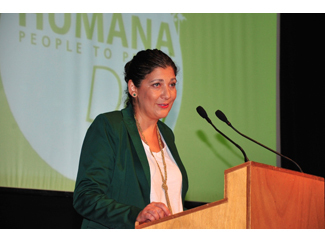 Humana Day will take place in Seville, in October 10th, at 18:30 hours in the Casino de la Exposición.